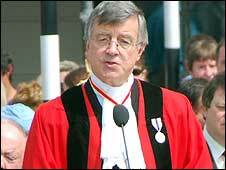 Jersey's former bailiff has said he was justified giving a speech on Liberation Day 2008 about a child abuse inquiry. In 2008 Sir Philip Bailhache said the real scandal was what had been written and said about Jersey since the investigation was made public. Sir Philip, who retired on Tuesday after 15 years in the post, was criticised for the speech. Police are probing claims dating back to the 1960s relating to former children's home Haut de la Garenne. But Sir Philip said he stood by his speech and thanked States Members for their support, company and friendship. Sir Philip was appointed solicitor general in 1975 before taking on the role of attorney general 11 years later. He was appointed deputy bailiff in 1994 and became bailiff a year later.